As someone who identifies as a Boston lifer, April 15, 2013 changed how I feel about and experience this city; I'm sure that's the case for many. In the immediate days following the Boston Marathon bombings, I experienced many moments of clarity and dissonance. And every day since, I have experienced small touch points (e.g., errands on Boylston, communication with family in Watertown, runner friends training for April 21, my own modest runs) that make me think about the tragedy and its intense, penetrating ripple effect. And what stands out most to me -- what stirs at the core of all of my touch points -- is the positivity and how it has shined bright through acts of bravery, generosity, love, and strength. Last Friday when I was on Boylston Street, I walked over to check on the progress of the Boston Marathon finish line. I stood and lingered at the former site of the makeshift Copley memorial. I felt immensely proud to call Boston my home. Today is the anniversary of the Boston Marathon bombings, and as we remember and honor the lives of Krystle Campbell, Lu Lingzi, Martin Richard, Sean Collier, and the many injured, I wanted to share three simple ways you can show solidarity. To continue to spread the love and strength that has become a symbol of this city. 1. This Dear World (@dearworld) Boston Marathon project left me in tears. Absorb the stories and images of survivors and responders who returned to the finish line of the Boston Marathon. Share their stories. Emulate their strength, determination, and bravery. 2. 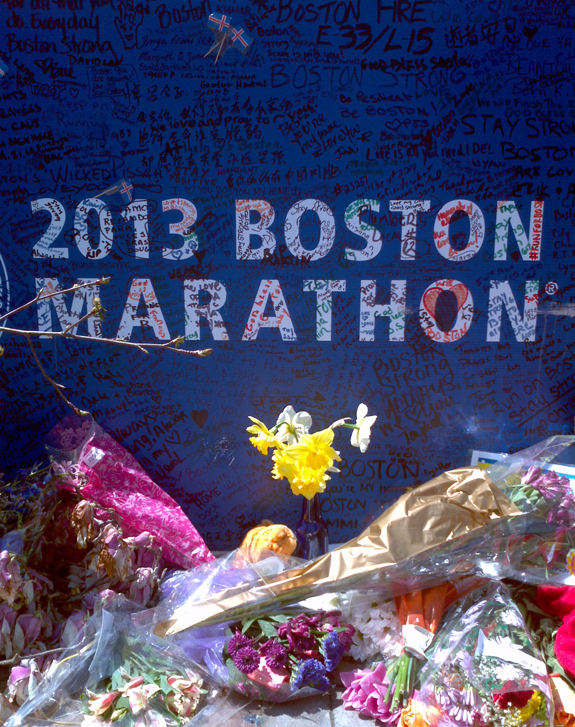 Pay tribute at Dear Boston: Messages from the Marathon Memorial at the Boston Public Library. This exhibit is open until May 11 and includes objects saved from the Copley Square makeshift memorial, which was a true outpouring of love and compassion. 3. Today, WCVB is hosting a telethon to raise money for One Fund Boston, the organization former by Governor Patrick and Mayor Menino the day after the bombings. Last year, OFB collected and distributed nearly $61 million to over 230 individuals most affected by the tragedy and they are planning a second distribution this summer. To donate, call 844-617-FUND or text BOSTON to 80108 to donate $10.